Location: Exterior of Canadian Western Bank at 10305 – Jasper Ave.
With the turn of the 20th century, the modern movement in art had begun. Avant-garde artists were no longer concerned about representing the world as it appeared – the camera could do that. Instead, artists were liberated to explore the world as it was felt or thought about. A fertile ground was laid for artists to experiment with proportion, form, technique and material and from this abstraction was born. 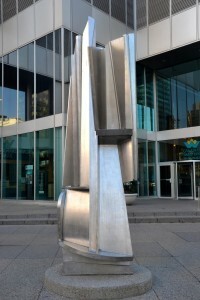 “For some thirty years, Edmonton has provided a unique environment for sculpture, especially for sculpture in the Cubist tradition. That tradition was started by Picasso almost a hundred years ago and was enriched by Julio Gonzales, David Smith and Anthony Caro. As one looks over the public art placed in the City, we can see the legacy of these traditions in the next generation of Edmonton artists including: Andrew French, Mark Bellows, Ryan McCourt, Bianca Khan, Rob Wilms, Linda Maines and Cynthia Sentara. Biography: A graduate of the U.K.’s Croydon College of Art (1964) and St. Martin’s School of Art (1967), Peter Hide is Professor of Sculpture and has been at the University of Alberta since 1977. A specialist in welded metal sculpture and abstraction, he is currently exploring the relationship between sculpture and architecture. He has exhibited widely and in an international context and his work is in public collections at the Tate Gallery, London, the University of California, Santa Barbara and the Alberta Gallery of Art.